After all, the director of Ghostbusters 3, Jason Reitman (Juno, Up In the Air), is the son of Ghostbusters and Ghostbusters II director Ivan Reitman (Kindergarten Cop, Evolution). Ghostbusters 3, reported to be released summer 2020, is a sequel to the original movies, not the 2016 reboot. Therefore, it stands to reason that more than just the original car and soundtrack would be tied to the original movies. Or are the new cast members random teens recruited by a veteran Ghostbuster to battle a return or resurgence of the paranormal? 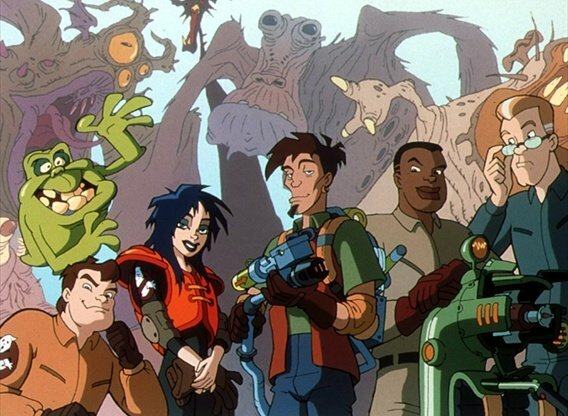 Think the Extreme Ghostbusters cartoon from the late ’90s. Although, obviously, Egon’s role would have to swapped out for one of the other original surviving Ghostbusters actors — actor Harold Ramis passed away in 2014 — my money would be on Ray (played by Dan Aykroyd). Aykroyd has always been very supportive and vocal about making another Ghostbusters movie happen. He even leaked the news months ago to Dan Rather that the original Ghostbusters would be getting together for another movie. Additionally, both the actor and his character are very fascinated with the supernatural. When the Ghostbusters got shut down in the second movie, Ray opened up an occult bookshop. It seems only natural that he would be keeping his finger on the pulse of the supernatural and be ready to help launch a team to combat any spectral resurgence. That barn from the Ghostbusters 3 teaser trailer could also be attached to Ray’s old home — the one he was born in, the one his parents left him, the one Peter had Ray take out a third mortgage on to start the Ghostbusters business — “Everybody has three mortgages nowadays.” Ray was also the mechanic of the group and “found the car” that became Ecto-1, so it’d make sense for him to be the one to keep the car. We see him working on the engine the time their first client walks through the door. Speaking of Sigourney Weaver’s Dana Barrett, I wouldn’t count her son, Oscar, outta the running for the man behind the new team. While Oscar might not be one of the new teenage characters, especially if Ghostbusters 3 is set in the present, I could see him as someone wanting to fight the supernatural, considering all that happened to him as a kid in Ghostbusters II. You know who I’d love to see play Oscar in Ghostbusters 3? Patton Oswalt. Oswalt has worked with director Jason Reitman in the movie Young Adult. While only a supporting character in that movie, Oswalt is both funny and nerdy, while being sympathetic because of something that happened to him in the past. I think he’d be perfect to play a grown-up Oscar. Of course, by that logic, maybe Reitman should hire two of his Juno stars, Ellen Page and Michael Cera, to play two new teenage Ghostbusters — assuming he’s not looking for actual teenagers to play the roles. Hollywood is known for casting older actors to play teenagers (Grease, Scream, I Know What You Did Last Summer, Final Destination). If they can look and act younger than they are, these experienced actors are easier to work with than teens. …and the good news is, most of the teens from Stranger Things already have their own Ghostbusters outfits. Now all that remains is to get Eleven a uniform and a proton pack! In addition to any new teenage cast-members and the original Ghostbusters, I hope we see more familiar faces from the first few movies. I know Sigourney Weaver is great about appearing in sci-fi comedies, having appeared in Galaxy Quest and Paul, so I’d expect to see her again. Annie Potts (who played receptionist Janine Melnitz) is still in show business, having voiced Bo Peep in the Toy Story movies, as well as appearing in various live-action roles. She made a cameo in the 2016 Ghostbusters movie, so here’s hoping she’ll be back for another cameo. I always appreciated her dry comedy. The coup for Ghostbusters 3 would be to bring Rick Moranis out of retirement to return to the role of Louis Tully. He hasn’t appeared in a live-action role since the late ’90s, having left showbiz to raise his kids after becoming a widower. He has done voice acting since then for kid’s movies, including Brother Bear and BB2. As a fan, I know I’d be thrilled to see Rick Moranis return. If he’s the dad of one of the new Ghostbusters, that’d be perfect. William Atherton, who played EPA agent Walter Peck, is another character I’d be amused to see make a cameo. Atherton is still active acting, having appeared in Tim and Eric’s Billion Dollar Movie and had a recurring role in Season 2 of Defiance. His also voiced his character in the Ghostbusters video game, which in a way was a sequel to the original movies. Whether he’s able to bring back original supporting characters for cameos or not, I have complete faith in director Jason Reitman to make a great Ghostbusters movie. I’ve seen most of his movies and would recommend you watch Thank You For Smoking, Juno or Up In The Air… if you haven’t already. The man knows how to make a good comedy that’s both funny and layered. The fact that he’s also been a writer for most of his movies only adds to his credentials. He’s one of the writers for Ghostbusters 3, along with Gil Kenan (who directed Monster House and 2015’s Poltergeist). Jason has said he’s been a fan of Ghostbusters since he was a kid. His dad took him to the set of the first film and young Jason got to play one of the kids at the birthday part in the second movie. It sounds like he has the respect for the franchise that fans expect and the experience needed to make a fantastic Ghostbusters sequel. As a nod to the fans, I hope this movie establishes Ghostbusters throughout the country. As Billy Murray’s Venkman said in the first film, “The franchise rights alone will make us rich beyond our wildest dreams.” Not because of the money, but because I want everyone to be able to dress up as a Ghostbuster if they want to. I’ve seen all different kinds of cosplayers portray Ghostbusters at comic conventions for years, I just want the film franchise to make it official for the fans.